Originally published in 1989, Prince Valiant: The Storytelling Game is the late Greg Stafford’s second approach to Arthurian, chivalric roleplaying and his love letter to Hal Foster and Prince Valiant in the Days of King Arthur. At the time, it was as simple as it was groundbreaking and even three decades on, its combination of simple rules, excellent storytelling advice, and shared narrative mechanics serve to make it look like a very contemporary game design and a perfect introduction to Arthurian roleplaying, Prince Valiant in the Days of King Arthur, and storytelling roleplaying. Unfortunately, Prince Valiant: The Storytelling Game never received any more support beyond the core rules, but with the republication of the roleplaying book following a successful Kickstarter campaign, the publisher, Nocturnal Media also released the Prince Valiant Episode Book. 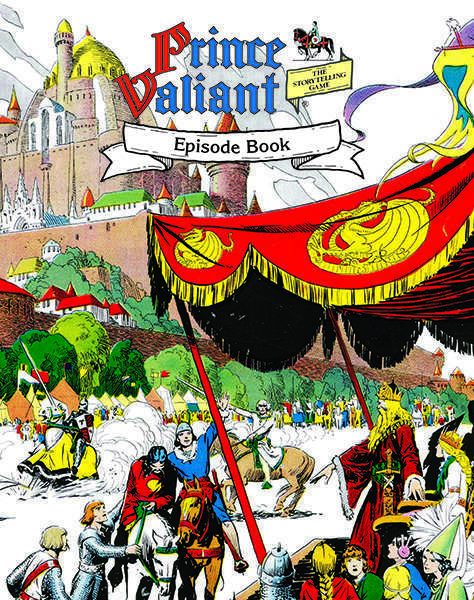 The Prince Valiant Episode Book consists of some thirty-four episodes—or short scenarios—contributed by a who’s who of the gaming hobby. They include Shannon Appelcline, Emily Care Boss, Ed Greenwood, Jeff Grubb, Will Hindmarch, Ken Hite, Chris Klug, Robin D. Laws, John Nephew, Chris Pramas, Mark Rein•Hagen, Monica Valentinelli, John Wick, amongst others. Each episode is typically two or three pages in length and each follows roughly the same format. This includes the episode type—such as Assistance, Attack, Mystical, or Nuisance; the Situation, the Name of the primary NPC and who they are accompanied by; their Long and Short Term Goal; their Planned Activity and Personality; the scenes for the episode; and lastly the stats for Characters involved in the episode. The format is easy to follow and makes each of the episodes easy to prepare and run. In general, it is assumed that the player characters are all knights at the court of King Arthur, but some episodes do demand that at least one player character be a knight. The thirty-four episodes include bandits, Saxons and treachery, bandits, jealousy and deceit, bandits, a Kraken—or three, bandits, wreckers, the fae, bandits, pride and poverty, bandits, scoundrels, and of course, bandits. Despite their involving an awful lot of bandits, there is not a bad episode amongst their number. Some good ones include ‘ First Flower of Spring’ by BJ Hensley, in which the knights get to hunt for the first flower of spring for King Arthur so that he might present it to his wife, Guinevere. This provides an opportunity for the player characters to interact with the other knights of King Arthur’s court as well as undertake some travelling across the land. In Epidiah Ravachol’s ‘A Wedding in Green’, the travelling adventurers get dragged into a wedding along with a reluctant abbot, but with an enthusiastic would be bride and groom, whilst in Sage La Torra’s ‘No Traveler Returns’, the player characters have decide what exactly the motives of a group of raiders are—are they really trying to give themselves up? In the main, the episodes involve a mixture of combat and action and intrigue, so if there is anything lacking it is courtly doings. The one exception to that is ‘Marriage, but Only for the Right Reason’ by Robert Schroeder in which romance is matter of debate and determination. Physically, the Prince Valiant Episode Book is as handsome a hardback as the Prince Valiant: The Storytelling Game. Again, it uses lots of Hal Foster’s terrific illustrations—typically one per Episode—on white, glossy paper which showcases his artistry and use of colour. Each episode is neatly organised and easy to read and use and some do come with suggestions as to Experience Point awards, but others do not. Unfortunately, the Prince Valiant Episode Book is not very well organised—in fact, it is not organised at all. The problem here is that it is presented episode after episode, neatly and tidily, but that is all. There is no index, and no table enabling prospective Storytellers to select an episode by type, location, and so on. This makes the episodes difficult to find and difficult to determine their suitability for the Storyteller’s campaign and use as episodes for players to run should they want to take a turn being the Storyteller and so earn themselves the Storyteller Certificates that give their characters an advantage in the game. Barring the unhelpful organisation, the Prince Valiant Episode Book is both lovely and helpful—and not just for the Prince Valiant: The Storytelling Game. Of course, the various storylines in the Prince Valiant Episode Book will run fairly easily with Pendragon – Chivalric Roleplaying in Arthur’s Britain and with further adjustment, with Age of Arthur. With even more of an adjustment, though not necessarily a great adjustment, the contents of this supplement would also work well in Legend of the Five Rings. After all, duty and hour are integral to the settings of both roleplaying games. For the Storyteller who wants to something to run for her Prince Valiant: The Storytelling Game, whether it be inspiration for a plot or a full episode, the Prince Valiant Episode Book is not just lovely and helpful, but definitely useful too. Of course, the fact that it gives a array of industry luminaries the space to visit of the world of Hal Foster and Greg Stafford’s grounding breaking roleplaying game is both a bonus and a feature—a highly fitting feature.